SPECIAL ANNOUNCEMENT: Alvi Armani Wins 2015 Consumer Choice Award! 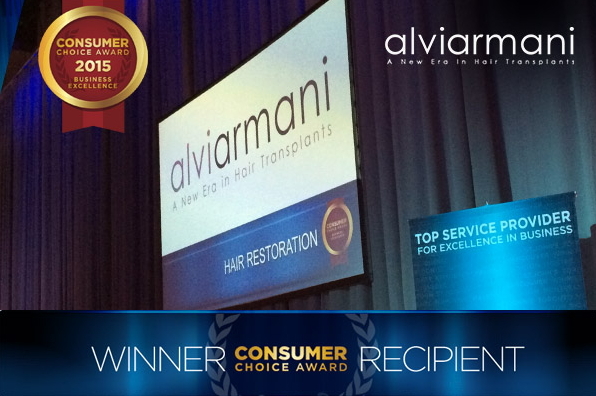 Alvi Armani has been selected as the 2015 Consumer Choice Award winner in the category of Hair Restoration. Through an independent market research survey, the consumers and businesses have selected Alvi Armani as the top-ranked organization in the Hair Restoration Industry. Consumer Choice Award was established in 1987 with the sole purpose of recognizing business excellence for small and medium sized businesses. No other award in North America statistically measures the opinions of consumers and businesses of markets it represents.